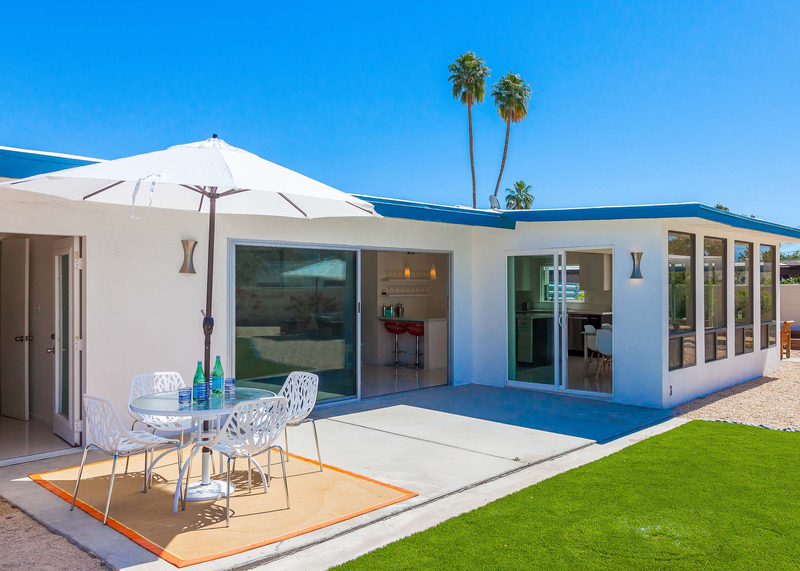 Sunrise Getaway is a stunning, bright, midcentury getaway that has been completely remodeled to create the perfect vacation home. 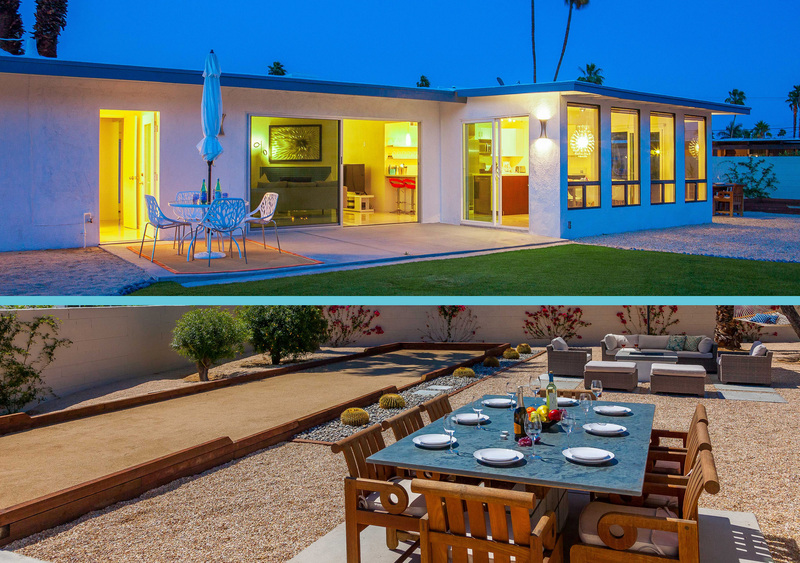 The owners respected the architectural pedigree of the property (Meiselman 1954) while modernizing it for the way we live today. 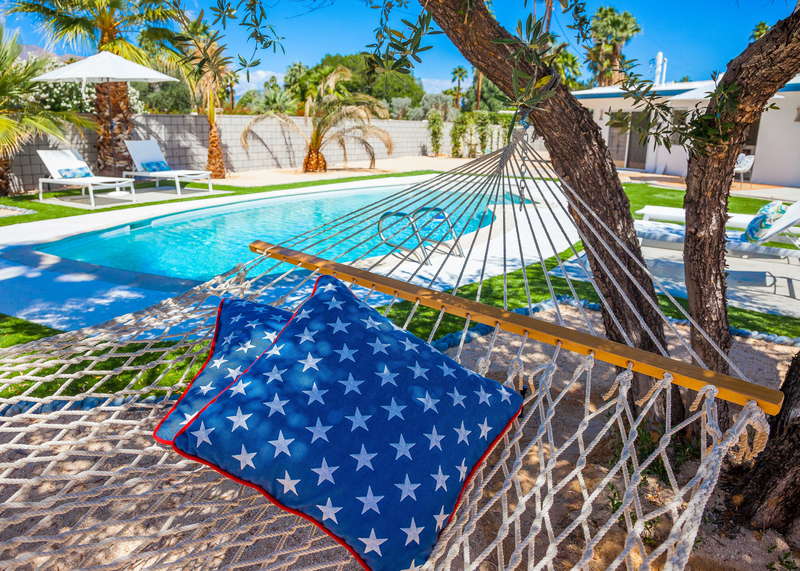 The result is a fabulous paradise where it's all about easy living in the sunshine. 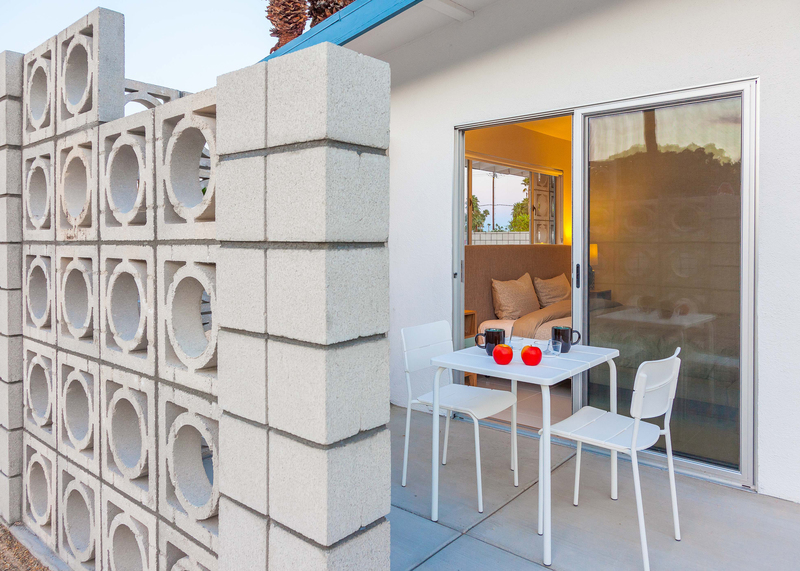 You'll find clean lines, an open concept floor plan and beautiful period-inspired art and furnishings that capture the Palm Springs vibe of yesteryear while being very "Next Century" at the same time. 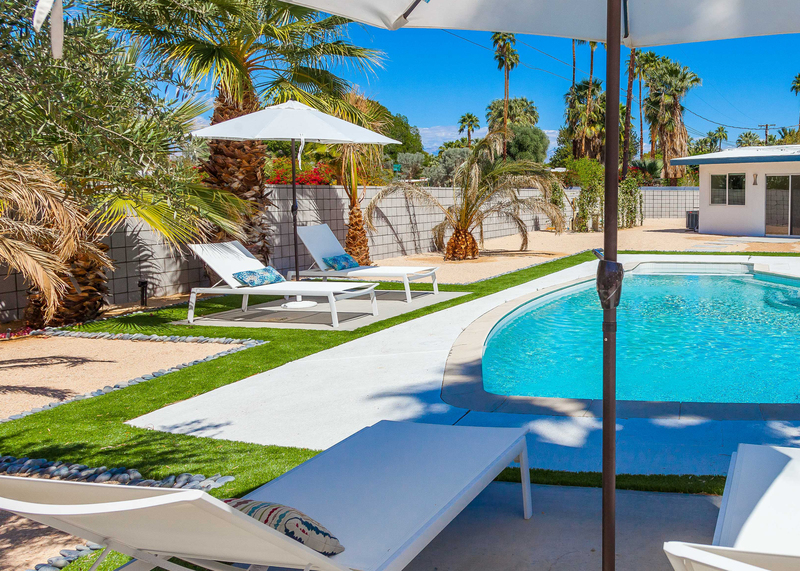 New center island kitchen, completely new baths, gleaming white floors, fabulous walls of glass, 4 flat-screen televisions, wireless internet access and a huge pool yard that has been transformed into the ideal desert play spot. 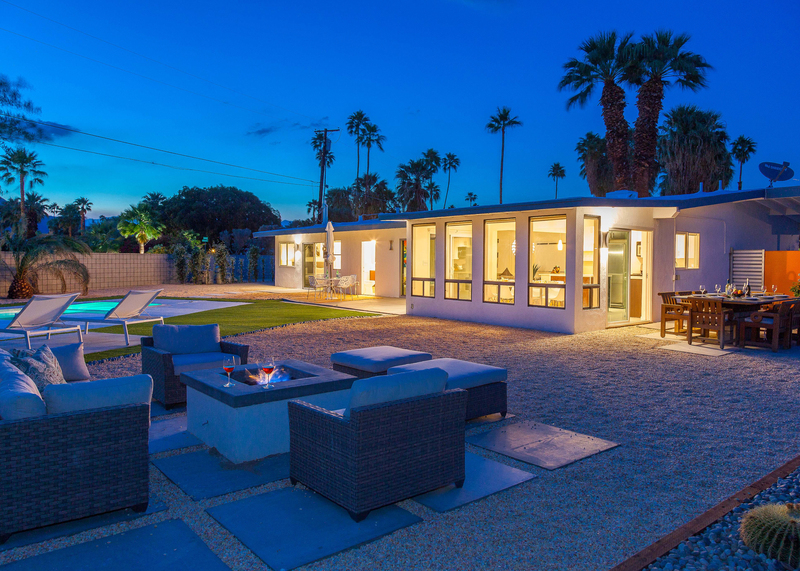 Gorgeous in its simplicity, as Mr. Meiselman and his architects intended, this home reflects the easy, laid back, California lifestyle. 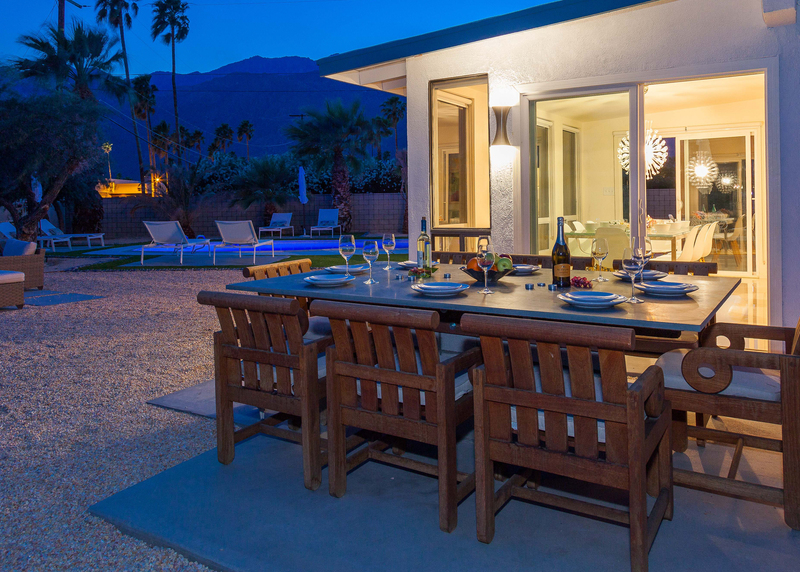 The open concept floor plan provides ample space for your entire group to spread out, relax and enjoy. 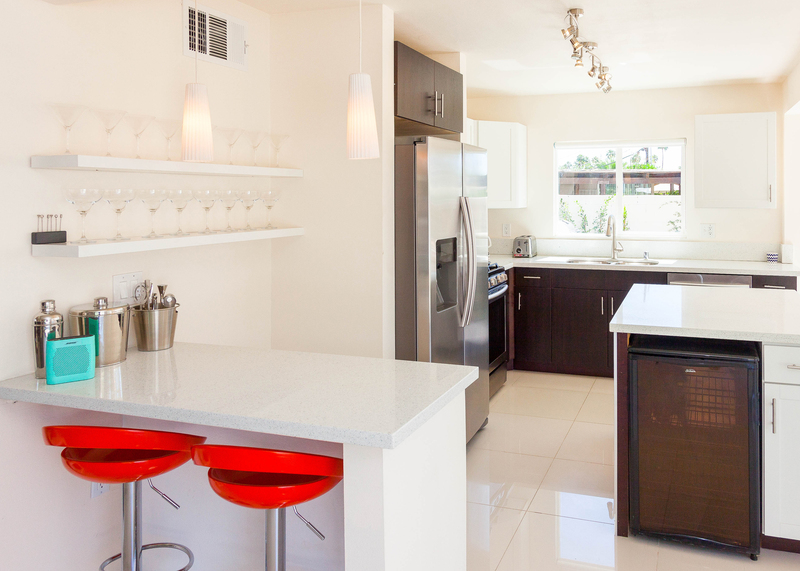 The fully stocked center island kitchen, with its stainless steel appliances, gas stove and stunning quartz countertops, has been carefully planned for both individual and group meal prep. 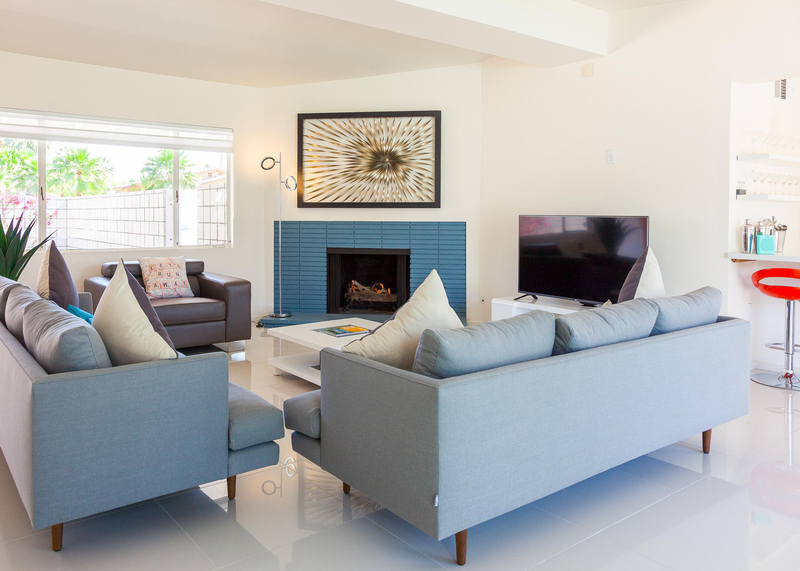 The modern kitchen is open to the interior dining space (sits 8-10) and the living area which offers plenty of seating for your entire group, a fireplace and a flat screen television. All along the back of the house are walls of glass that blur the lines between indoor and outdoor living'.revealing the amazing resort-style pool yard. 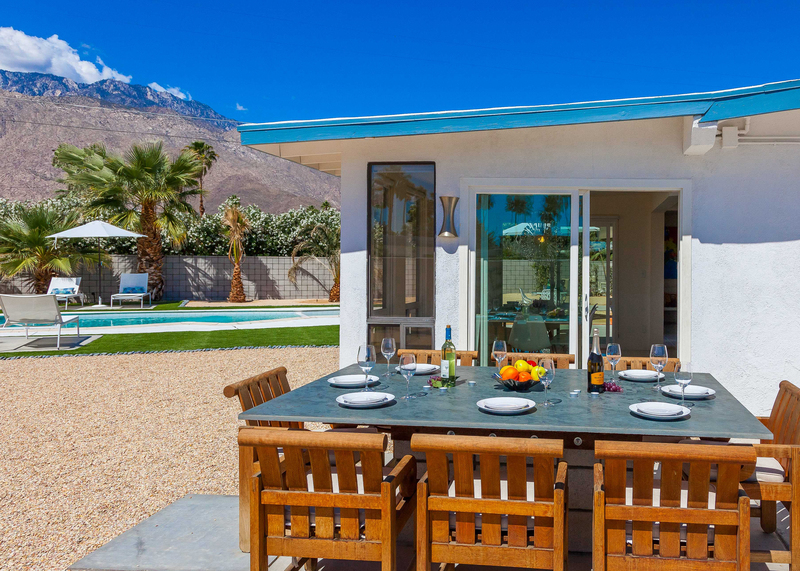 While the inside of this luxury vacation home is gorgeous, it's the sun-drenched pool yard and the magnificent mountain views that are the crowning glory. 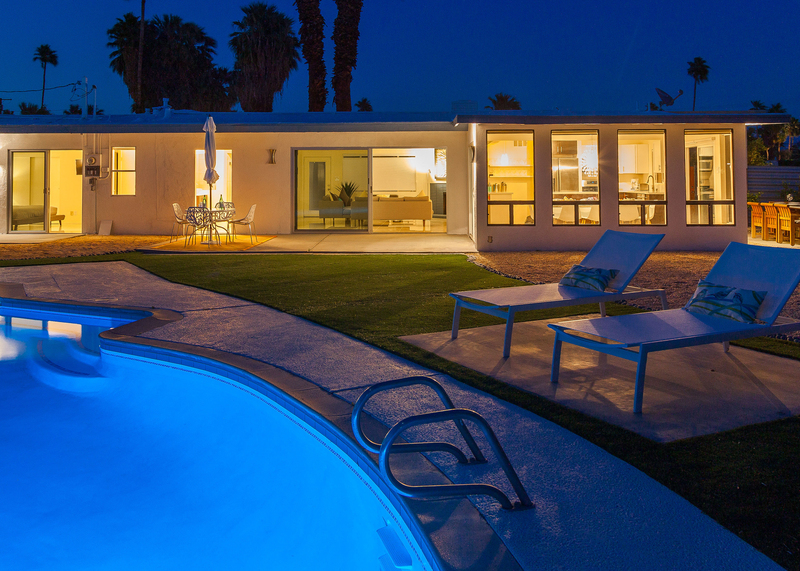 This property has been walled for privacy, beautifully desert-scaped and carefully space planned to really have fun! 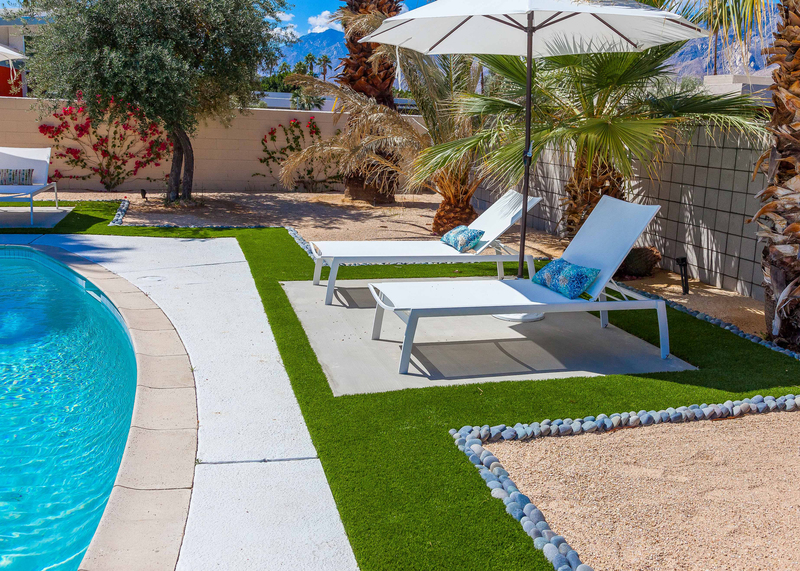 The heated, in-ground pool and integrated spa are surrounded by comfortable chaise lounges and shade umbrellas - providing that resort-style experience. 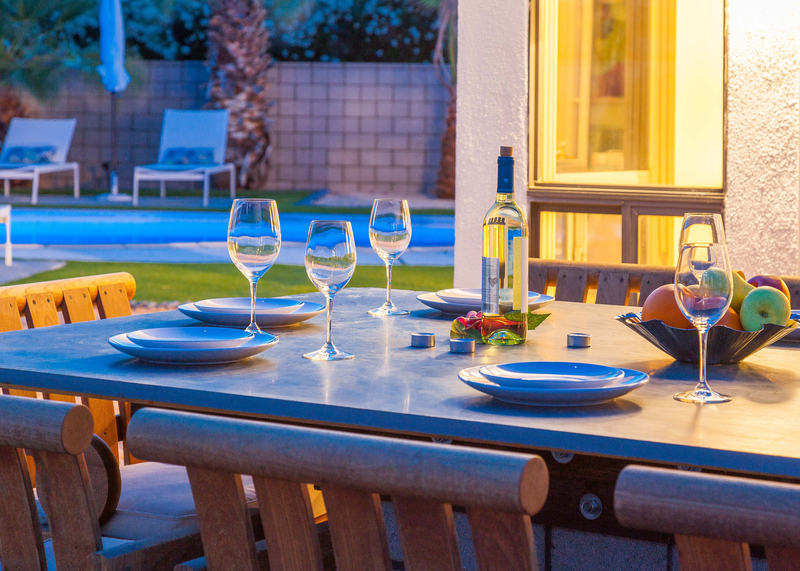 You'll also find alfresco dining for 8, a gas barbecue, an outdoor living room, a fire pit, a hammock, an official-sized Bocce Ball Court and green areas for playing lawn games and allowing Fido or the little ones to run around. 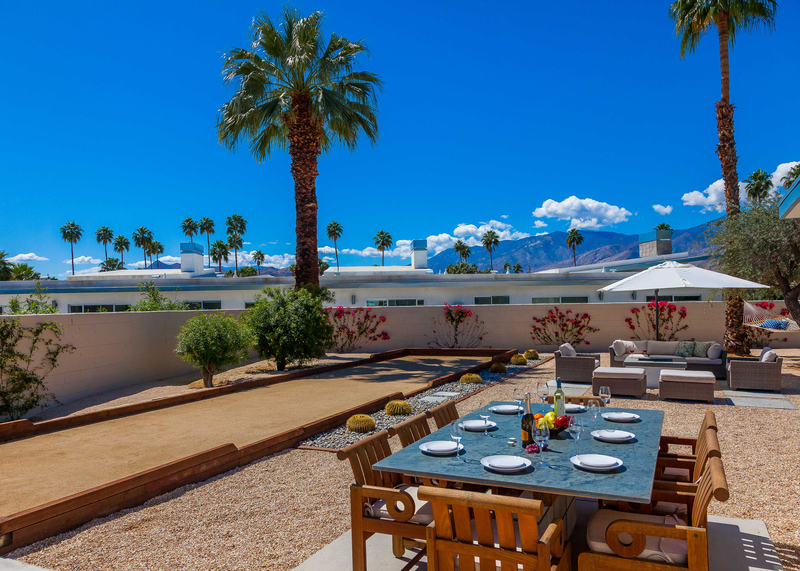 The natural desert landscape, palm trees and fabulous mountain views are stunning. 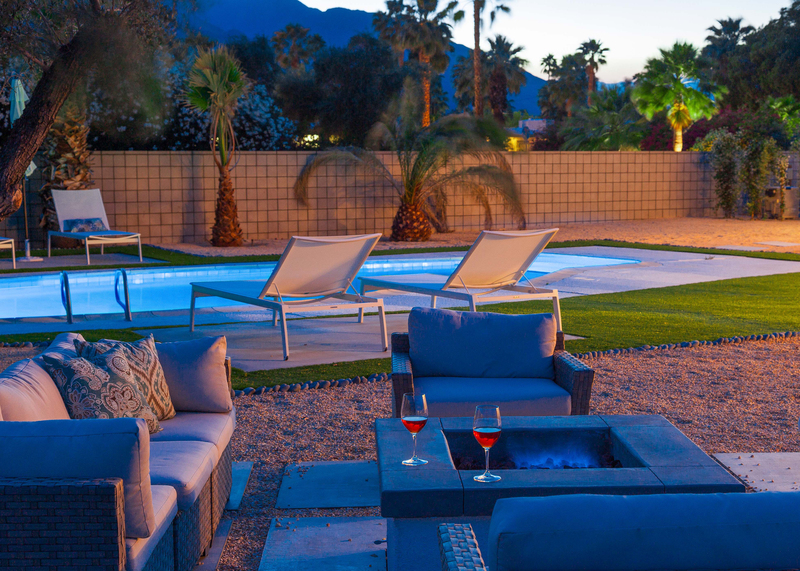 Sunrise Getaway has been designed for quiet peaceful enjoyment where it's all about living the good life in the warm desert sun. Like a very cool boutique hotel, the sleeping quarters have been uniquely designed for comfort, catching up on sleep, and for stepping away from the rest of the group for some privacy. 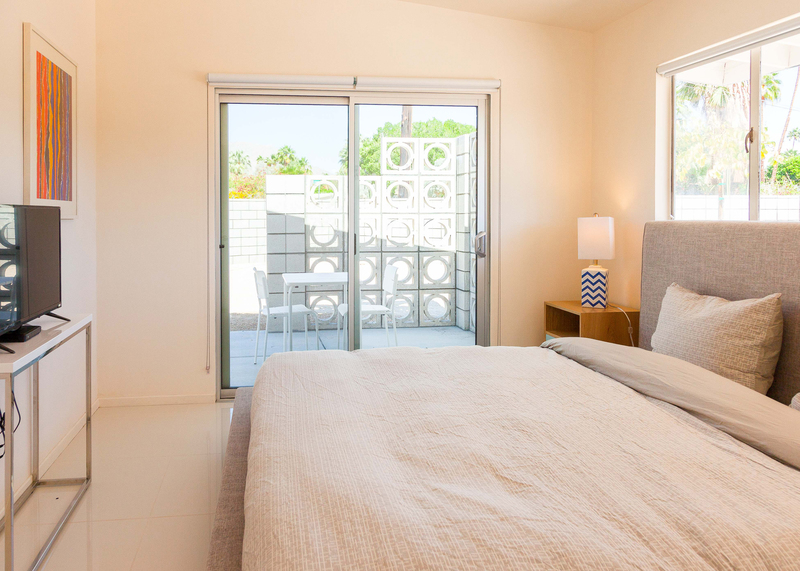 All of the bedrooms feature hospitality-quality mattresses, ample storage, and a flat screen television.The master offers a king-sized bed, a private en suite bath and direct pool access. 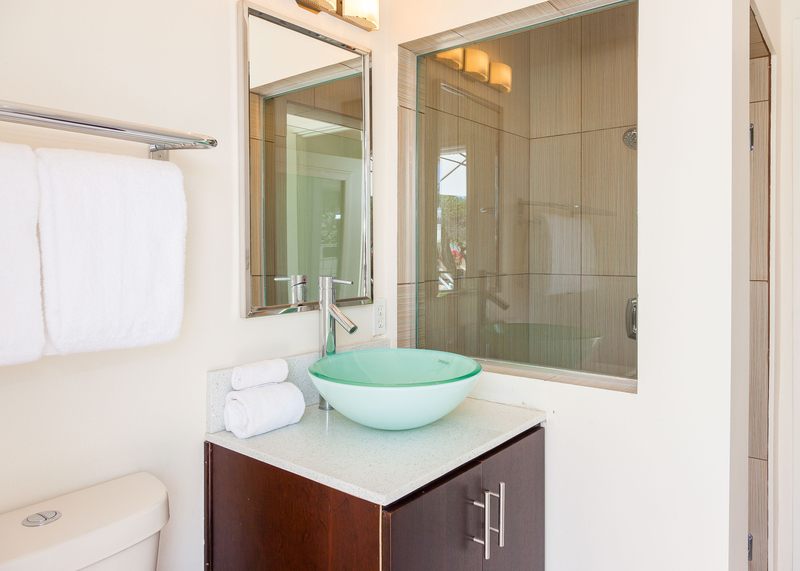 The two other guest rooms share easy access to a full bath. 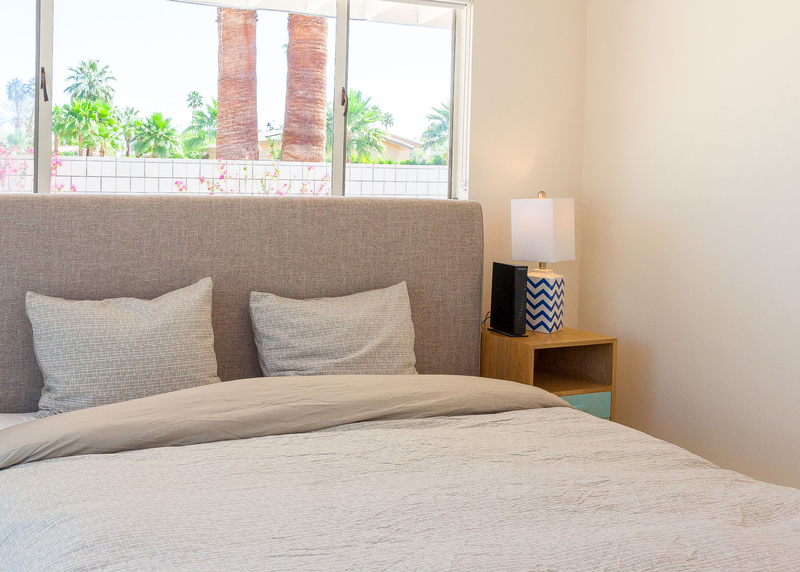 One has a king-sized bed while the other offers flexibility to suit your group. 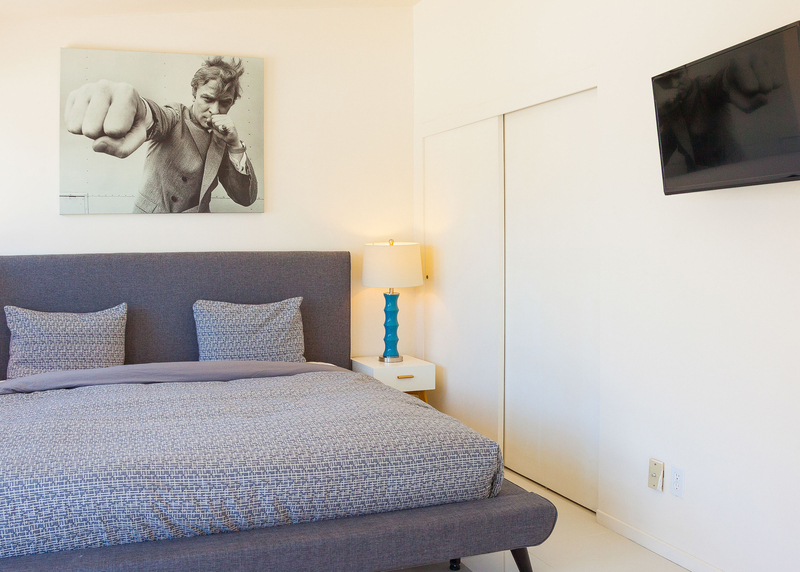 You can choose to have the third bedroom set up as two twin beds or a king. 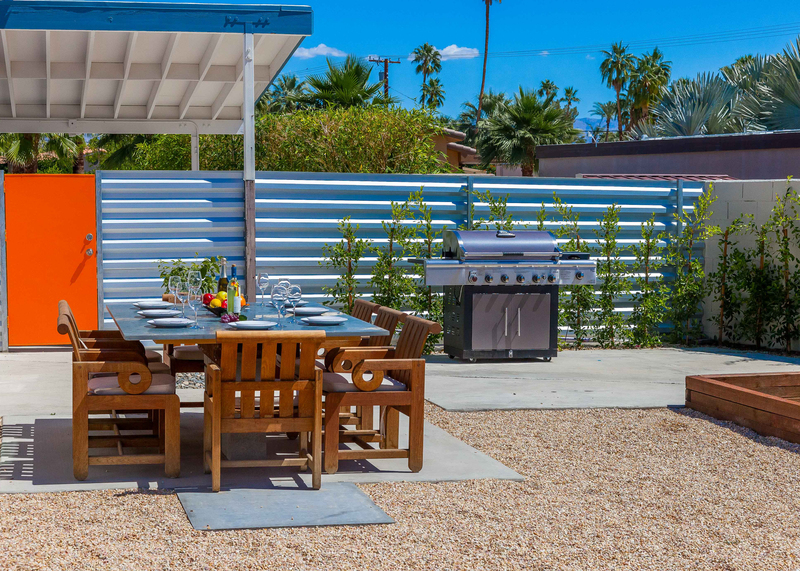 This property is centrally located in the quiet residential Sunrise Park neighborhood just minutes from the Uptown Design District, Downtown, and the South Palm Springs Business District. Restaurants, night spots and grocery stores are just a short drive away. You'll be in an easy stroll from the Certified Farmers Market, Ruth Hardy Park, The Dog Park, movie theaters, the casino, and the convention center. 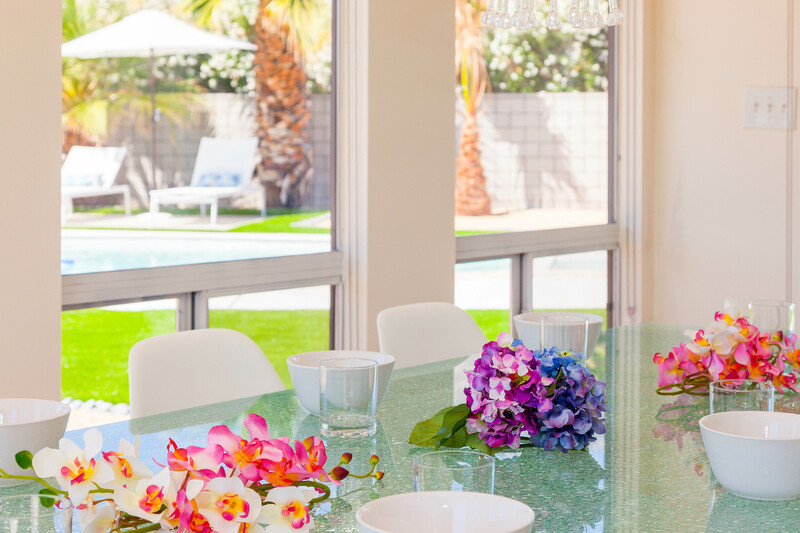 The close to town location makes Sunrise Getaway suitable for extended long weekends, weekly stays, month-long visits and as a seasonal rental. Advanced bookings strongly advised. "We stayed at the Sunrise Getaway. As always, ACME has lived up to its reputation. 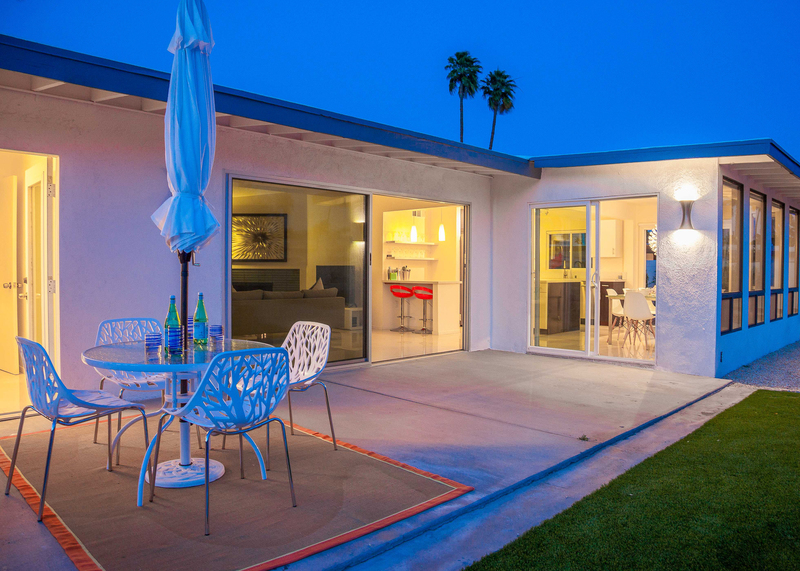 The home was immaculate and spacious and a perfect blend of contemporary and convenience. Customer service at ACME is second to none. They've always made themselves available at a moment’s notice and always with courtesy and kindness. 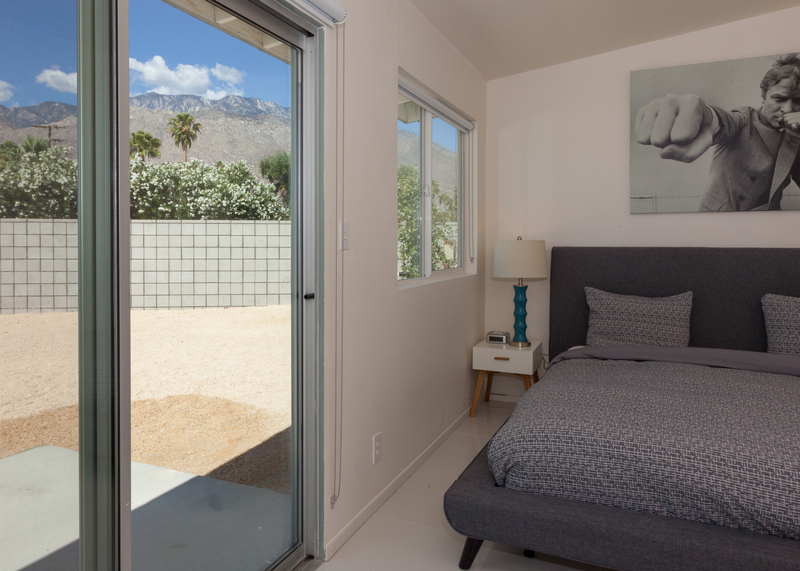 There's no secret why so many (including us) choose ACME for their Palm Springs vacation rental year after year!" No Surprises! Exactly what we wanted! "Beautiful house. Great back yard with gorgeous pool and magnificent mountain views. Central location near everything. Very happy with our stay. Looked even better in real life. Highly recommend." "The house was perfect. The pool yard was really nice and well appointed. The location worked very well for us - close to everything. High ratings for how well the house was maintained. The furniture and art seemed very high end and expensive. Very positive overall experience but the management team wouldn't allow us to check out late because there was someone checking in that day. 10:00 am was just way too early to have to check out and we think they should have let us stay till noon. " Manager Response: Thanks for the feedback George - especially for pointing out how well the house was maintained. It is really difficult for us to extend checkout on a day when someone else is checking in. We just can't get the house up to our guests standards in 3 hours. If someone requests/reserves a late departure in advance we can usually preplan for a larger clean team to come in to do the turn. We do need that advanced notice though. But the important thing is that you enjoyed your stay and had an overall positve experience. "We had a reservation with another management company who flaked on us at the last minute. They had nothing suitable as a substitute. We had read a lot of great things about Acme so we turned to them when it looked like our vacation was about to fall apart. The Acme team was amazing. So helpful. We will always go to them first in the future. Sunrise Getaway was absolutely lovely. 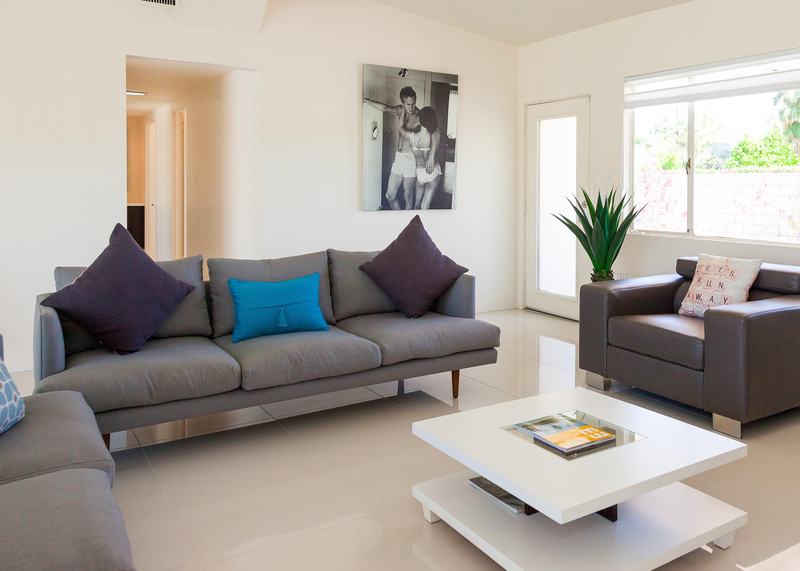 Spacious, clean, very well maintained and gorgeous. I feel a little sheepish about only giving 4 stars because it really is a beautiful property in a very nice neighborhood. But we really missed staying in the Las Palmas neighborhood. 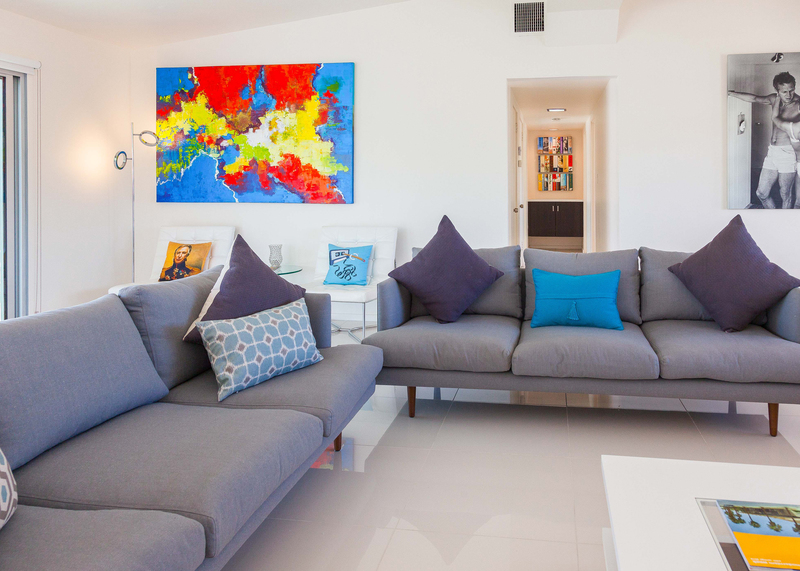 For those of you who are not married to Las Palmas - this property is a very good choice." "This property is outstanding, clean, modern and a great location. 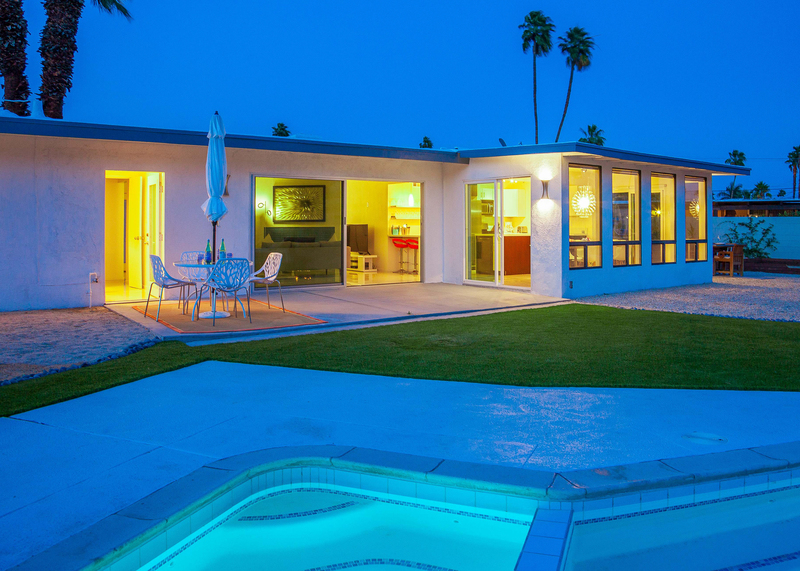 I highly recommend it for anyone traveling to Palm Springs. " "Everything was as described, a lovely property. We had a very comfortable stay!" Really Enjoyed This Vacation. Great House. 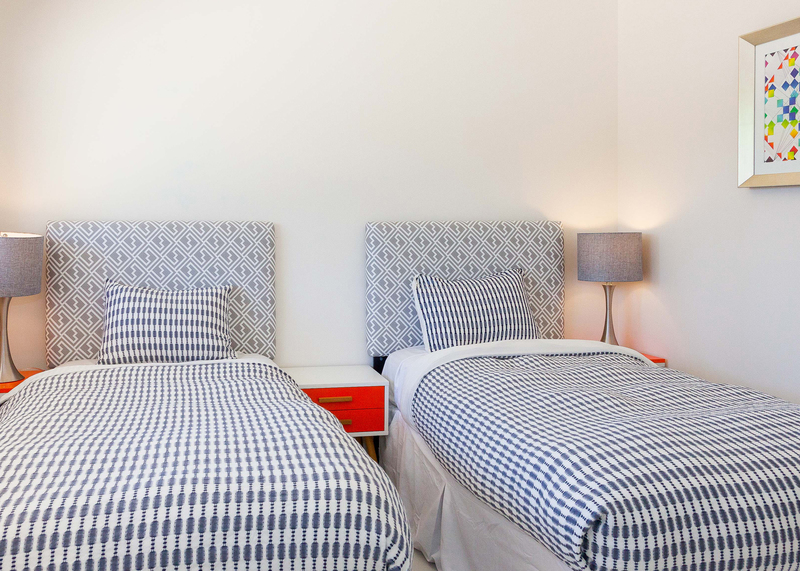 "We had read about Acme House Company in a Chicago magazine. 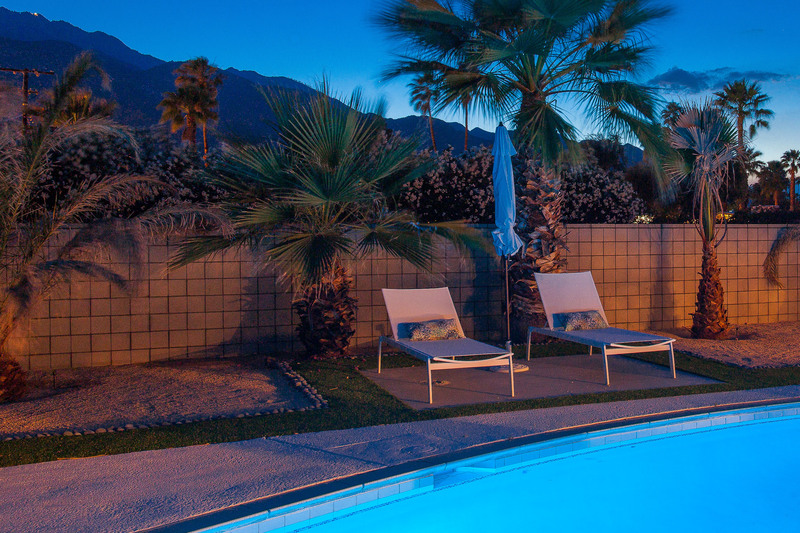 Then friends of ours told us they use Acme every time they go to Palm Springs. More than one friend told us to either stay in a hotel or rent a vacation home from Acme because Acme Houses are always very clean and well maintained.. Sunrise Getaway was like dream. The house felt so comfortable. I''m a clean freak and even I was impressed with how spotless it was when we arrived. I didn't love the neighborhood, I would have preferred to be further south and a bit more away from town. But my husband and teenage kids thought the location was just great. Best part was the whole family playing bocce ball. Thanks Acme!" Perfect place to stay and relax. 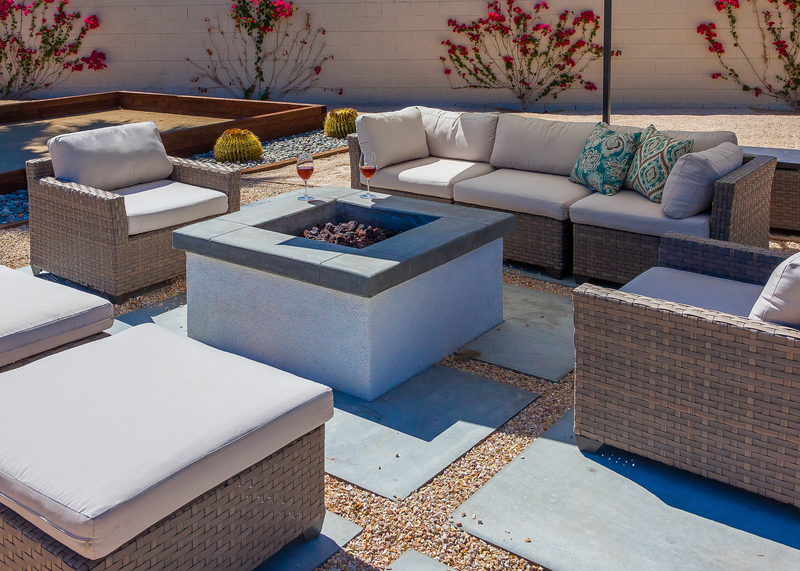 "Everything was taken care of and easy to manage. Loved the app. 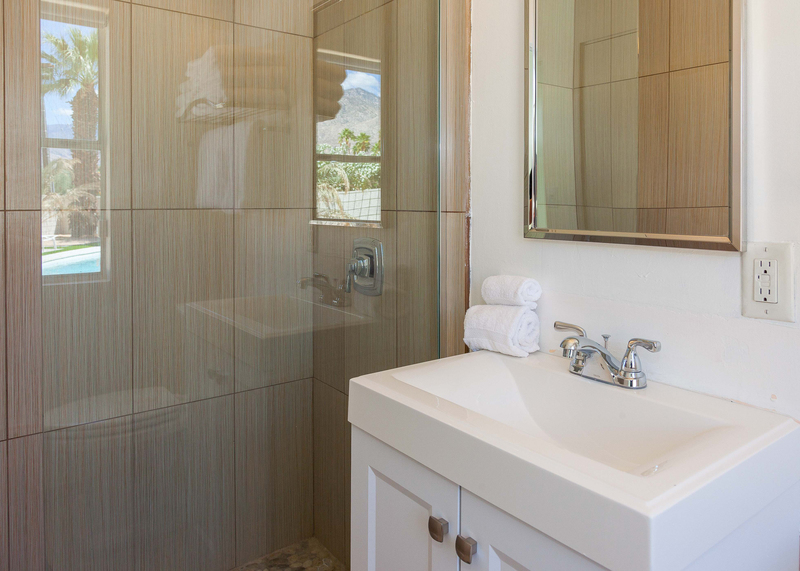 We loved the amenities that were offered, how well decorated and furnished the property was, and the central location. Loved chilling by the pool. Also, the check in and checkout could not have been easier! Good job! " "We loved our stay! As much as we loved the house, we lived outside. 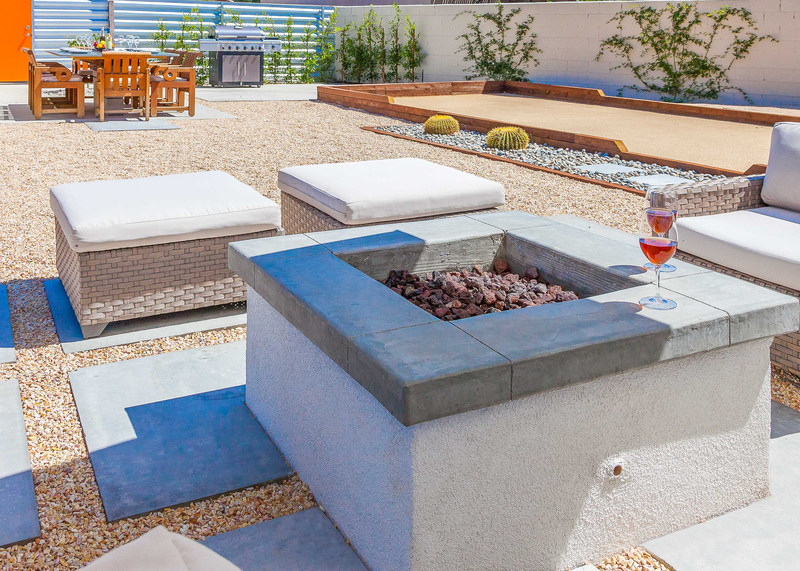 Beautiful mountain views, lounging in the pool, hot tub, hammock, and loungers...bocce ball court, outdoor grilling, and fire pit. Honestly, there isn't anything they didn't think of including. Indoors was a cool respite with the crisp colors and mid-century design. 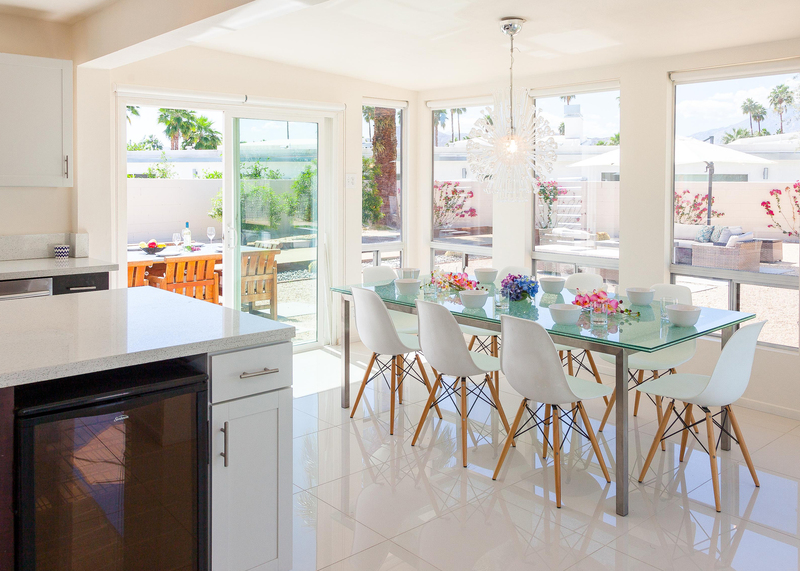 The open kitchen and dining area were perfect for entertaining our guests. The house is very well appointed with everything we needed...and immaculate. Can't wait to return! Thank you for our stay."